You can’t talk about Bristol Motor Speedway without acknowledging two of the most famous crashes in NASCAR History. 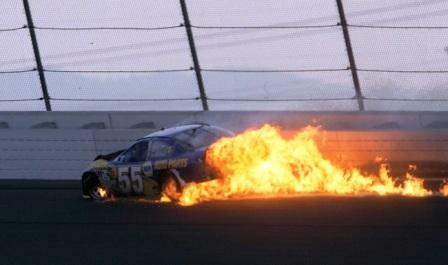 This first occurred in 1990 — during the Budweiser 250 NASCAR Nationwide Series race — when Michael Waltrip (pictured above) sent his car into turn two, causing an impact so great that it practically tore his car in half. Waltrip walked away from the incident with nothing more than “some contusions and a little bit of confusion.” His older brother Darrell, however, couldn’t believe his brother walked away at all. Just 12 years later in 2002, while practicing in his NASCAR Nationwide Series car, Mike Harmon crashed into turn 2 as well. His car essentially disintegrated on impact, although he also walked away unscathed. Two drivers, two separate wrecks into the same gate, and two lucky tales of survival. New rule: Always respect Bristol Motor Speedway.